This photo was submitted by Katy Bodenhorn. I'm Katy Bodenhorn. 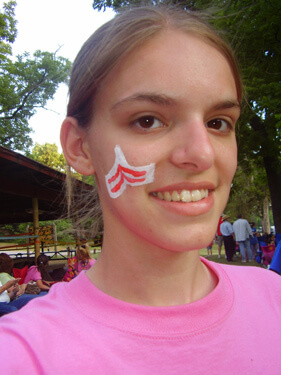 This photo was taken at a recent carnival at a church camp where I asked the face painting girl if she could paint the Phantom Regiment chevron. I had to draw her an example, but she did it. This fall I'll be sophomore in high school, and in a few years I plan on marching in a corp. Phantom just happens to be my favorite.